These were all found by using the Find feature of LibreOffice (available in all word processors). Tedious at times? Sure, but you can either do it yourself or pay someone. Lack of income means it was time to buck up and take the job. The next attack was on Passive Voice. Not sure what I’m referring to? No problem, here are two great articles on Active Voice and Active vs Passive Voice. To accomplish this required replacing some passive words with the phrase, REPLACEME in all of your text using the Find/Replace feature of your word processor. 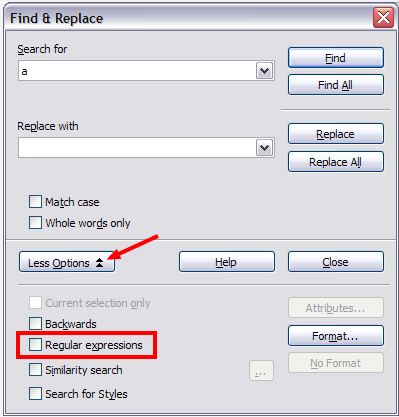 To make the process faster, I made use of the Regular Expressions option within LibreOffice. This allows you to FIND using a regular expression. The expression below will search for all the words listed in the center that have a space on both sides of the word, and replace them. Click Replace All to make the sweeping change. Out of 26,500+ words, this function replaced over 1000 words! It took the next two days to go through each one and either put back in the same word, because it was correct, or fix it. That may mean replacing it with another word, rewriting the sentence, or simply deleting it. Lots of work, 1000 less words in the book after edits, and a stronger, tighter narrative. Round three will be in one week, because I need time to step away from your writing to be able to edit it properly, and I will be reading the entire thing, one paragraph at a time, backwards. Last paragraph, first-to-last paragraph, etc. This helps you disconnect from the story arc and concentrate on sentence structure. This entry was posted in Books and tagged writing on September 29, 2011 by Mario Lurig.